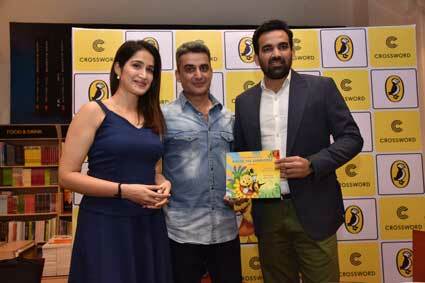 New Delhi: On Friday, Crossword Bookstores and Puffin India Publishing launched The Adventures of Biplob the Bumblebee by author Abhishek Talwar at Crossword Bookstores, Kemps Corner. Former Indian cricketer Zaheer Khan also attended the event. The book has been illustrated by Sonal Goyal. Entertaining and interacting with the kids, Preeti Vyas, Founder, FunOkPlease, along with the author Abhishek Talwar read out a few pages from the book. Sportsperson, model, and award winning actress Sagarika Ghatge and gynaecologist Dr. Nozer Sheriar, were part of the panel discussion along with the author. Role models, the importance of reading early on, and the character of Biplob the Bumblebee were discussed by the panelists. The Adventures of Biplob the Bumblebee consists of three short stories. The protagonist Biplob, inculcates love for nature and how to conserve it and has a simple narrative explaining the concepts of pollination, rainwater harvesting and natural pesticides through colourful illustrations. The vibrantly illustrated stories promise to teach kids something new through lessons on science and friendship.